A customized error 404 page will display when the page you are trying to access does not exist. We have added a new search visibility feature to display selected records on any search popup window by greying out the checkbox. This will provide a better visibility of identifying which records are selected and can be selected. In the first screenshot, you will receive the email if you are replying back to a previous system-generated email for a particular task, but you are no longer assigned or the task has been deleted. If you are an administrator and is no longer assigned to that task, you can still reply back and your message will be captured in the General chat. 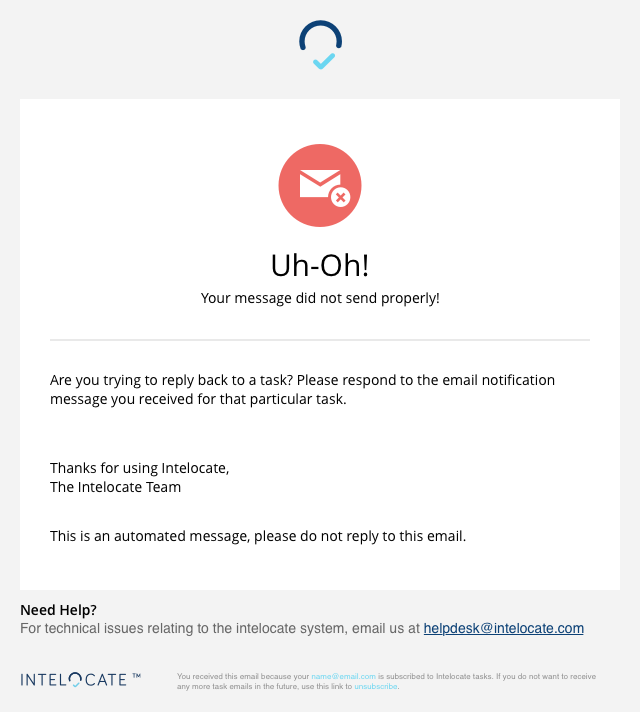 In the second screenshot, you will receive the email if you are sending an email directly to actions@intelocate.com and not responding back to a system-generated email for a particular task. We have improved the search functionality across the system to provide better search output result. We have removed a restriction related to a task’s start date email notification. Task assignees will now receive the notification of any start date. Users that are assigned to a parent task will now be able to access its child tasks. We have removed a horizontal scroll bug on the New Project creation window. Task’s form sub-tab will now properly display saved forms instead of occasionally displaying cached forms from a previous task. You can now properly save location names that contain the ampersand (&) symbol. The Status and Assigned fields are now properly aligned for some tasks in the actions sub-tab.